I'm reposting this for Chari's Sunday Favorites over at Happy To Design. I'm not usually a fan of large flowers on vintage tablecloths, but this one is an exception. Cityscape flatware, contemporary glassware. Roses from my garden. handpainted with gold highlights and also cold painted. Such a fun table. Definately worth repeating. Another beautiful tablescape. I know its magnolia blossoms, but the colors remind me of apple blossoms. That donkey vase is very fetching, do you have all those colors in your collection? My mom had a donkey kind of like that. It was terra cotta and had a cactus growing in it's back. I love pink and green together. A lovely table setting for sure! I really like the large flowers on the table cloth, and it is a great shade of pink. Beautiful! I thought of you yesterday when I bought a vintage tablecloth. I have no idea what kind it is, but boy is it in great shape. 18.00 is all I paid, so I was really excited! 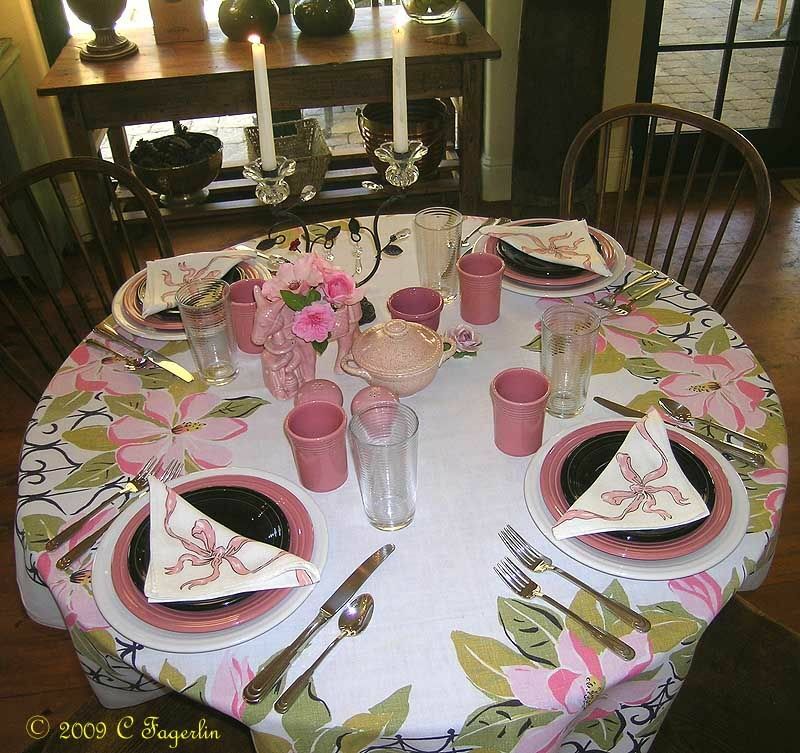 Love your beautiful vintage "magnolia" tablecloth! That's such a pretty shade of pink! 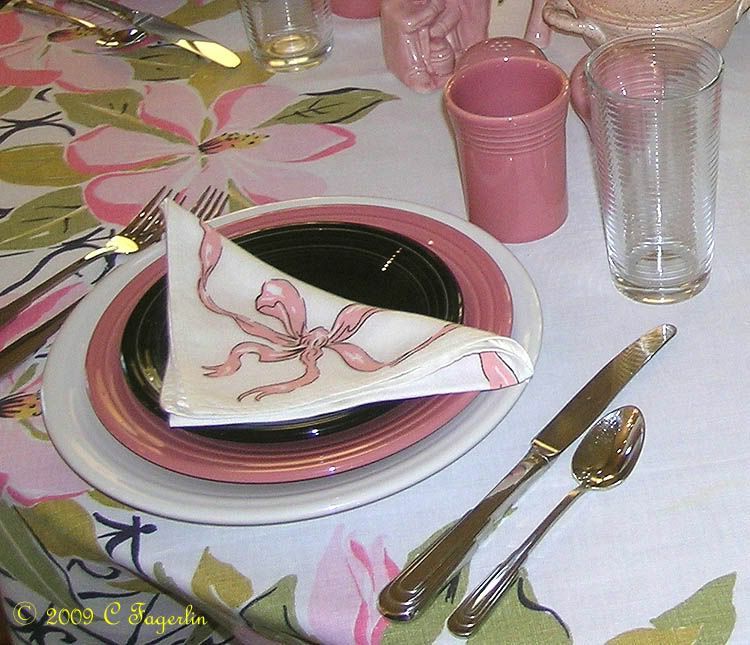 The fiestware pink goes perfectly with the tablecloth! I also really like those sweet, pink ribbon napkins! Gorgeous, my friend! Thank you for sharing your beautiful table with us today for Sunday Favorites!!! Eye candy! 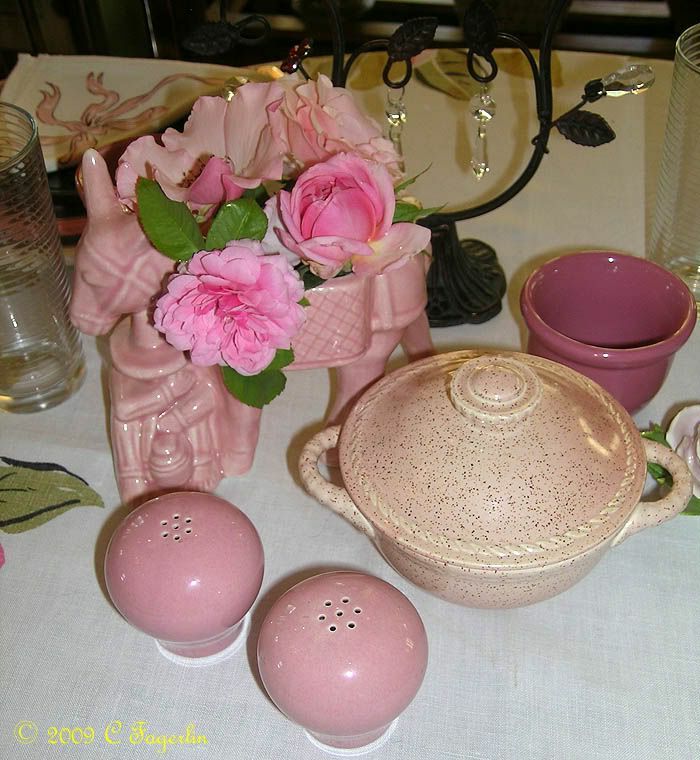 Loving all the pink on your table. Thanks for re-posting! Its all new to me. Mary - Congrats on your tablecloth! Be very very careful ...... they are very addicting! Jane - Donkeys are like rabbits, they just seem to multiply! I think I have about a dozen in my collection! I have a McCoy basket with a glaze simliar to the fruit skin...must have been a pottery trend! I think of it in the same way I think about the "crystalline" glazes. Beautiful, but perhaps not something that would work for mass production. So many great ideas from the past.